Sometimes we make the mistake of underestimating unfairly quality ham. It is true that this is a type of ham cheaper than the Iberian Acorn and that the quality is usually lower. Nevertheless, that does not mean quality Leg a ham is low. You will be surprised to know the true delights you can find whose label is not Iberian. 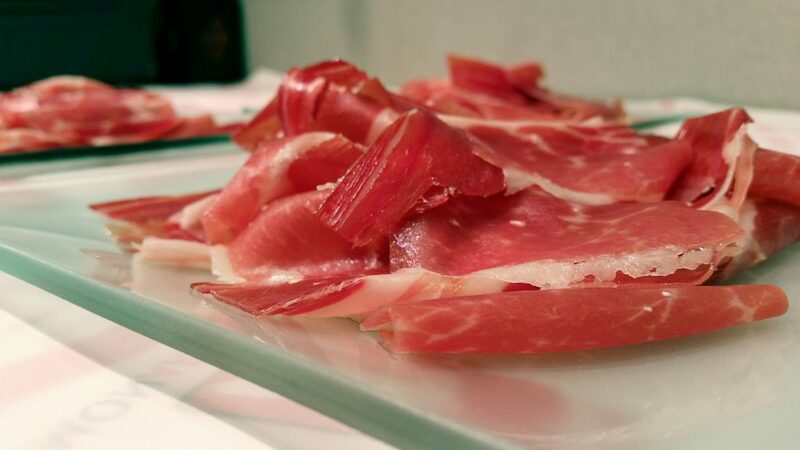 From here we ensure that there serrano hams that have nothing to envy their fellow Iberians. So to check in situ We invite you to our specializing in hams and store in Barcelona, Pernil181, for you to try our serrano ham and thus can judge our claim first person. First of all and to avoid confusion should make clear two concepts that are sometimes treated as synonymous but they are actually two different products: the ham and cured ham. Serrano Ham and Cured Ham are not the same. The only point in common with each other is kind of ham it is that both come from white pig. Nevertheless, the key aspect that distinguishes them is not the kind of pork, but healing product. While in the case of prosciutto minimal healing time it is 11 months, in the cured ham does not exceed 7 months. Herein lies the great distinction between the two, in a longer cure ham can develop its full aroma and flavor, which increases its quality. Also, Serrano ham is certified Traditional Specialty Guaranteed thing cured ham possesses no quality designation. The healing, key element in the quality of the ham. – Reservation: Serranos curing hams 12 a 15 months. – Gran Reserva: Serranos cure hams with more than 15 months. The rest of serranos whose cure is less than the 12 months but more than 10, It has no special designation. A ham whose recovery exceeds 15 months is a ham of the highest quality, and is the only type of ham and palette we offer in our store. Serrano ham Savor the best of Barcelona in Pernil181! If you want to eat a good Jamon Serrano Gran Reserva and see firsthand that has nothing to envy to an Iberian acorn, We invite you to visit our store in Barcelona. You'll find many options to choose serranos, whole, boning, chunks or boats. And all Gran Reserva, Quality guarantee. We have more than 30 years of experience behind us selling the best Iberian ham and Barcelona. Attend your doubts and questions to the best of our smiles. We will wait for you! We are specialists ham, Acorn, and Serrano in Barcelona. With our shop selling ham and gourmet products in the Gracia district of Barcelona offer the best service products maximum quality. We are in our shop in Barcelona from more than 30 years old. Hope you!!! If you're looking for ham cutter in Barcelona or contact us surroundings. We work with a professional cutter liven up your event with a good cut and a lot of sympathy. The quality hams course is guaranteed!!! Sale of hams and gourmet quality products online. We ship to all Europe with messaging. Visit nuetra online store and find all your favorite products and discover new and delicious.